I have had the most fun day today. We bid farewell to the last of our graduation guests yesterday (sniff), then I spent the entire day today playing with cinnamon sticks. Say what??! Trust me. I’m pretty sure you’ll want to spend a couple of hours playing with cinnamon sticks too after you read this. I typically think of cinnamon sticks as something to use in the fall. This led me to do a little research. What can we do with cinnamon sticks in the summertime? THIS is the part where I become giddy. I have found so many awesome uses for these this summer! Not to mention I’ve discovered that cinnamon sticks are wonderful for our health. Cinnamon can help lower cholesterol levels, aid in pain relief, help with digestion, help us avoid bladder infections, and help regulate blood sugar levels. And that’s just the beginning. 10 great ways we should all use Cinnamon Sticks this summer. Special thanks to my son Asa who used his talent with his brand new camera to help me get some wonderful shots of our cinnamon projects today. 1. 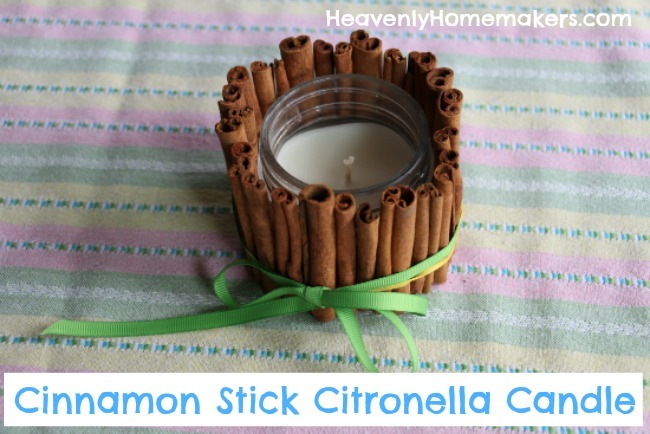 Use Cinnamon Sticks as a Natural Insect Repellent. Insects don’t like the smell of cinnamon (silly little bugs). Plus they don’t like the feel of powdered cinnamon. Grate a cinnamon stick then sprinkle it around any place (inside or outside) you’re trying to get rid of ants or other annoying bugs. You can even sprinkle it around your kids’ sandbox to keep the bugs away. Brilliant! Want to avoid mosquitoes? Put a small citronella candle inside a jar. Tie or clue cinnamon sticks around the outside of the jar. Light the candle outside while you’re sitting around visiting and enjoying the summer weather. Insects are turned off by the smell of the cinnamon and citronella, and you can enjoy the scent plus the freedom from bugs! 2. Treat an insect bite. Bugs already got to ya? Mix up a little bit of honey and ground cinnamon. It will alleviate pain and itching. At the same time, this honey/cinnamon combination will disinfect the area while moisturizing and healing. Amazing. This is not only a great way to repel bugs inside and outside – it is super adorable! 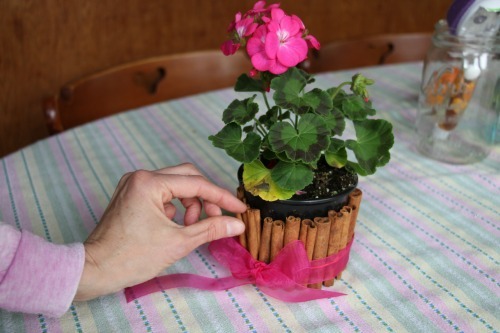 Hot glue 25-30 cinnamon sticks around a flower pot. 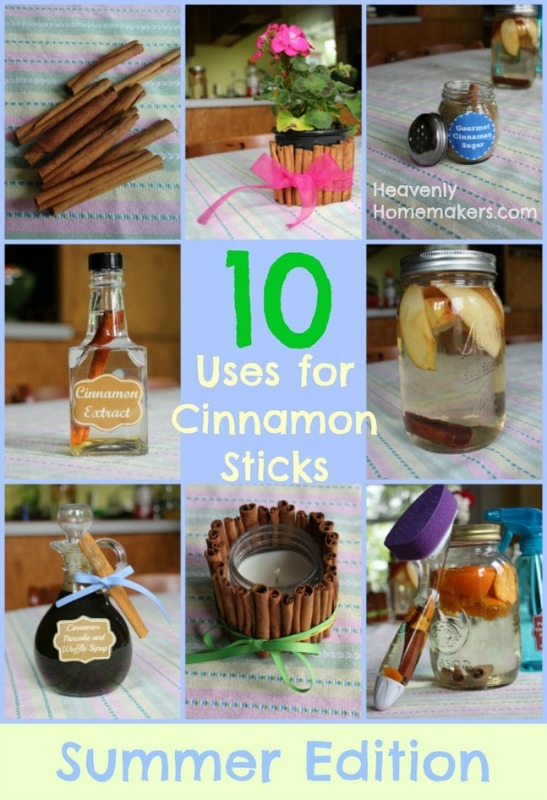 Tie a ribbon around the cinnamon sticks to complete the project. I can’t stop staring at my flower pot in all its cuteness! 4. 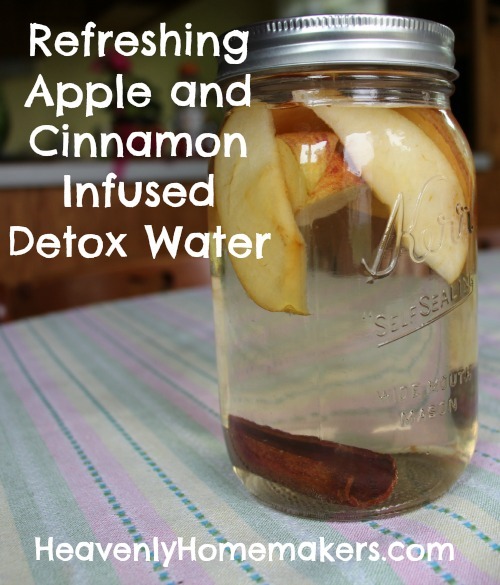 Make Cinnamon Apple Infused Water for a refreshing detox drink on a warm day. Or use fresh or frozen pineapple with cinnamon sticks instead. Either way, you’ll have a cool, refreshing drink that is good for your system. Simply slice one apple (any variety) into a quart jar. Add 1-3 cinnamon sticks. Fill jar with water. Allow mixture to sit for a few hours to infuse. Chill and serve. 5. 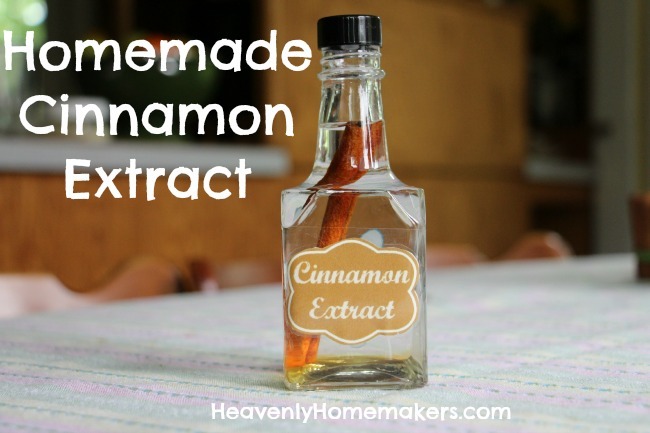 Start a batch of Cinnamon Extract for Christmas gifts. 6. 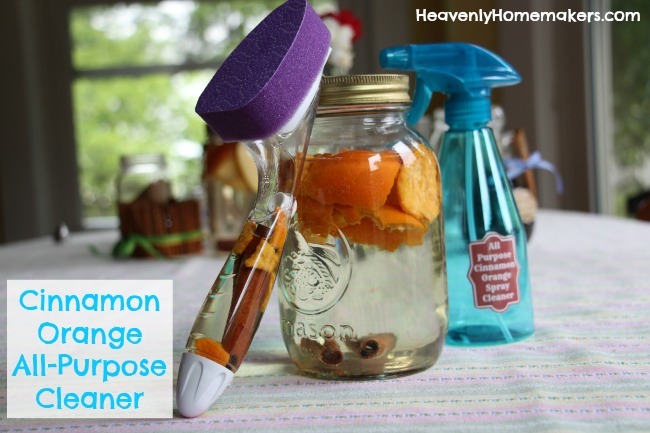 Make All Natural Cinnamon Orange Cleaning Spray. Here’s a fresh idea for non-toxic cleaning! Fill a quart jar about 3/4 full of distilled white vinegar. Add 3-4 cinnamon sticks and 1-2 oranges worth of orange peel. Secure lid. Store in a dark place (such as a kitchen cabinet) for two weeks, then strain out cinnamon sticks and orange peel to transfer liquid to a spray bottle. This is so simple and inexpensive! And here’s another great cleaning option: Put a Cinnamon Stick into a cleaning bottle with attached sponge (like the purple one pictured below) for a fresh, cleaning fragrance. 7. Grate a piece of cinnamon stick into yogurt or add it to a smoothie for a refreshing summer meal or snack. What a great way to add deliciousness to a cool treat! You can also grate cinnamon into your coffee or tea. Yes, yes, yes. Make this. Bottle it up for gifts or enjoy it at your own breakfast table. It is super easy to make and crazy delicious. Place all ingredients in a small saucepan. Bring to a boil, then remove from heat. Cover and allow mixture to steep for 15 minutes. Remove cinnamon sticks. 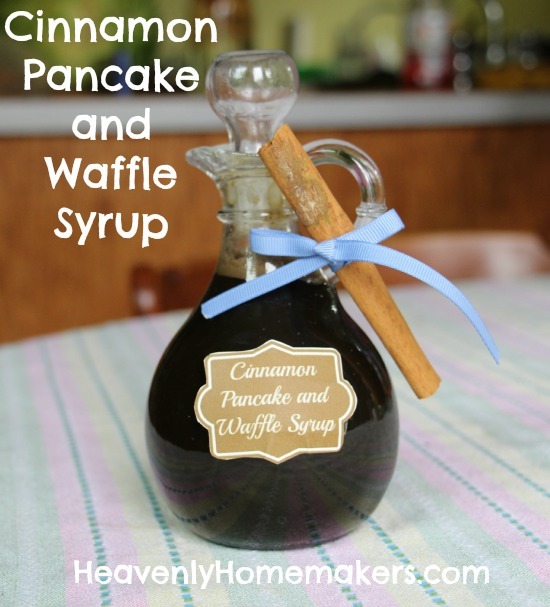 Store Cinnamon Pancake and Waffle Syrup in a jar in the refrigerator for up to two weeks. It does not get any easier than this. 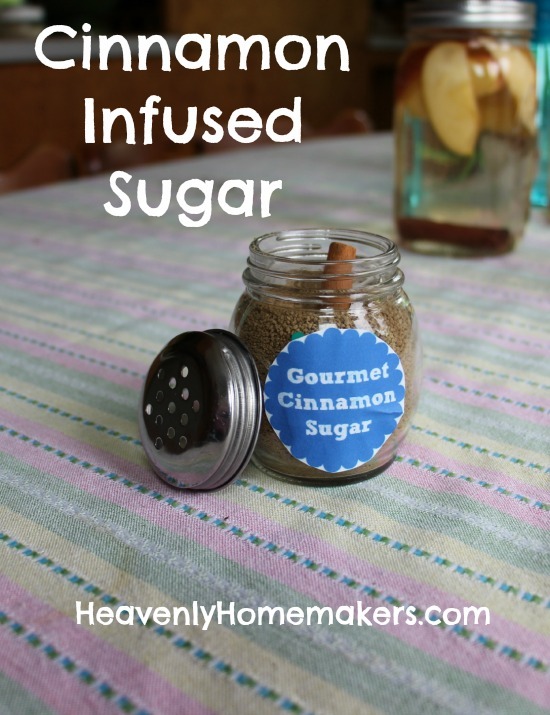 I’ll be including a jar of this sugar with my Christmas gifts of Cinnamon Extract. I should also include a loaf of bread and a stick of butter – then my recipients would be set. Put the cinnamon stick into a jar. Cover it with sugar. Secure a lid on the jar. Shake the jar once each day for two weeks. Use cinnamon infused sugar on buttered toast, in coffee, or any way you would typically use cinnamon sugar. Continue to refill the jar with sugar as the cinnamon stick will continue to flavor it for quite some time. Feeling tired, lethargic, or low on energy? Pull out a cinnamon stick and give it a whiff. It’ll help you find your focus. Who knew? Easiest energy boost ever. From now on, I’ll be keeping cinnamon sticks at my desk. Hmmm…just took a whiff of one right now. Perfect. Save $$. 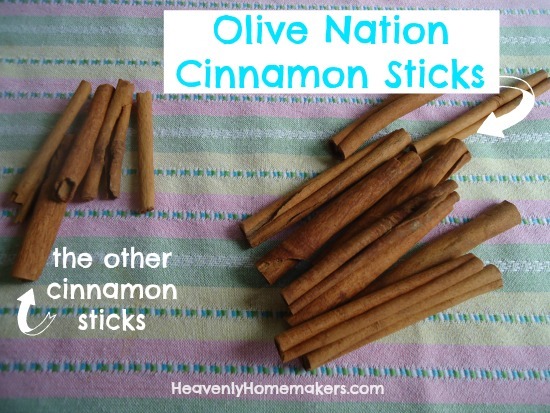 Get more than one use out of your cinnamon sticks! To reuse your cinnamon stick, simply rinse it under hot water then allow it to dry. Run the stick over a grater a few times to release the flavor. Do this up to 5 times before discarding. Way to get a lot of bang for your buck! Use the code home to receive 10% off your entire order. You may only use one coupon code per order, so figure out which is best to go along with your free cinnamon sticks: Get 10% off with the code home; or get free shipping on a $50 order with the code FREESHIP. 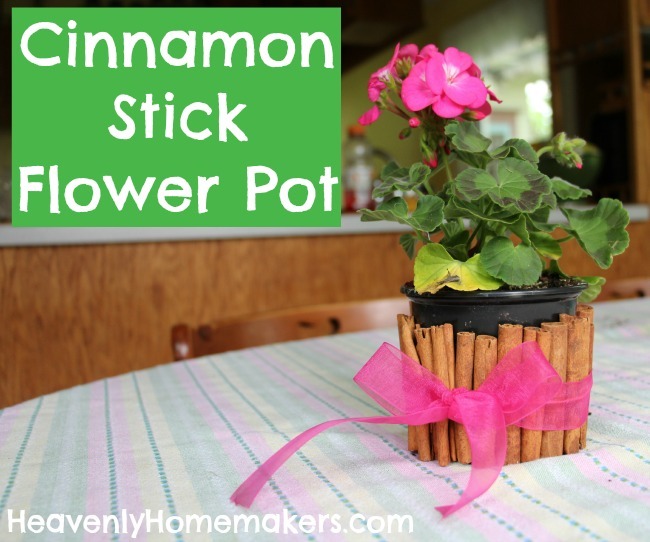 A Freebie To Go With These Cinnamon Stick Ideas! Download a page of free printable labels to go with the gifts you might choose to make: Cinnamon Extract, Cinnamon Sugar, Cinnamon Orange All Purpose Cleaner, and Cinnamon Pancake and Waffle Syrup. Attach them to your jars and bottles, tie with a ribbon, and you’ve got an adorable, inexpensive, and useful gift! 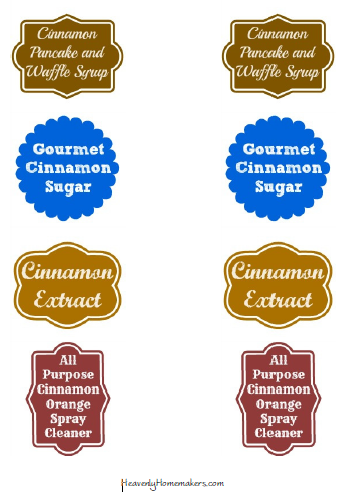 Download Your Free Cinnamon Labels Here. Leave a comment to tell us what you’re going to make first! I’ve never tried cinnamon on bug bites. Years ago I discovered that onion juice is basically a miracle cure for itchy skin welts. Just cut an onion and rub the juice on a bug bite and the itch disappears! I had a friend who used it on her kids chicken pox and she said that it worked wonderfully to help the itch when calamine lotion wasn’t doing much at all. Other friends have used it on poison ivy and poison oak welts and say it works just as well as on bug bites. I’ve used it on hives when hubby got into something that broke him out all over and it worked wonderfully there too. In fact, it works so well, I used a juicer to juice an entire bag of onions and froze the juice in ice cubes so I can just pull it out and rub it on and not have to bother trying to get enough out of the onion! The discount code ‘home’ is expired and isn’t working. :( I was hoping to order some vanilla beans. I thought it was still valid. I just emailed Olive Nation to ask, so I’ll get back to you asap! The code has been fixed! Sorry for the inconvenience. So glad it’s working again! Its not accepting Paypal, as that site won’t let you have a zero value for the item cost. If that makes sense? Thanks! My lazy fix was to add a penny. The cost of the item became $0.01, paypal worked, and cinnamon sticks are on their way. We have bananas freezing right now for that cinnamon smoothie. That will make a great snack! Oh, so sad. $23 is the cheapest they ship to Alaska for just the Cinnamon sticks. Oh well. Thankfully, I’ve ordered the Vanilla Beans for less shipping! I can’t believe I missed this!!! I saw it on the 23rd but then I got busy. This is just to warn others…DON’T PUT IT OFF. You will miss out.